Why Snap On Garage door Screen? You will have a new space and room that can function in several ways. Similar items are sold at Home Depot, Walmart & Bed Bath and Beyond but don’t match our quality or funtionality. 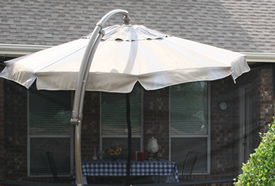 Socialize without insects interference and enjoy the fresh air screen that snaps on. Exercise in the privacy of your Garage. Watch a game or movies with friends or kids at night. Use as a goal to practice sports like hockey. As for functionality, our design offers less hassle snap on screen that can be installed inside of the garage door with a minimal amount of components used. Our screen installs in 15 or less minutes using only a Phillips screwdriver. When the garage screen is not in use, simply take it down and fold it until the next use. 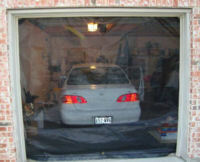 The screen is able to store in place and will not interfere with the garage door opening or closing. This minimizes the need to completely disassemble the screen and finding a place to store it when it’s not in use. The screen material and design can be used on virtually all Garage Doors, porches, doors, patios, etc.